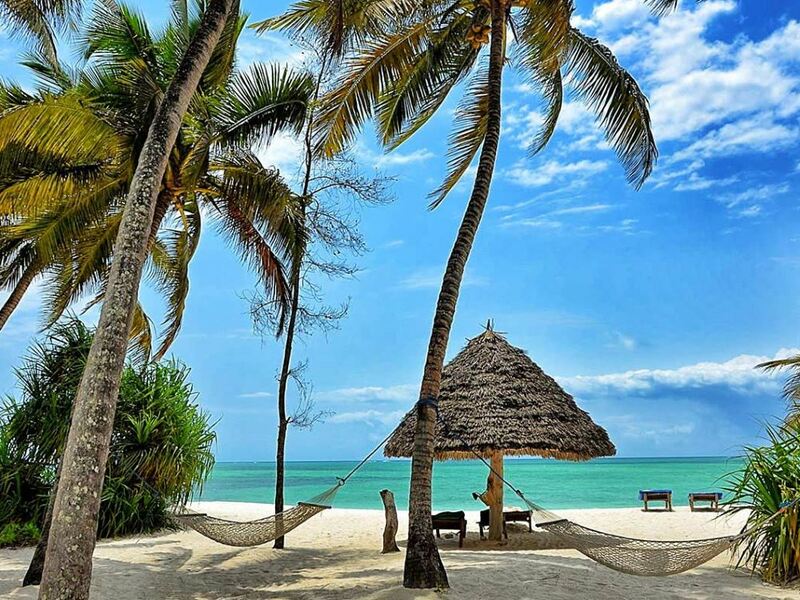 Stunningly beautiful beach setting – in our opinion THE finest beach in Zanzibar! Think perfect powder soft white coral sand attractively sprinkled with palm trees that offer shade as well as good looks! Unbelievably popular with honeymooners in particular - so often tough to find availability - try to book well in advance or prepare yourself for disappointment! 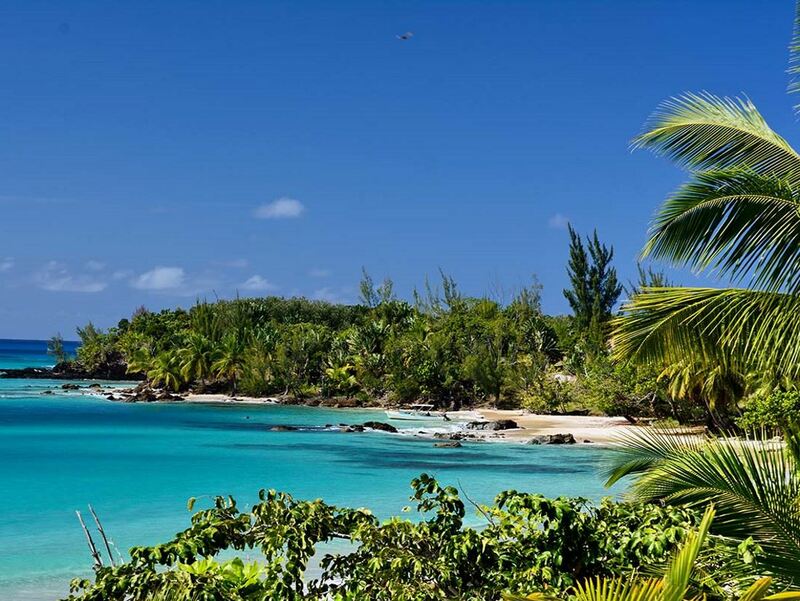 And it’s this stunning beach that will dominate your stay at this blissfully isolated little lodge. 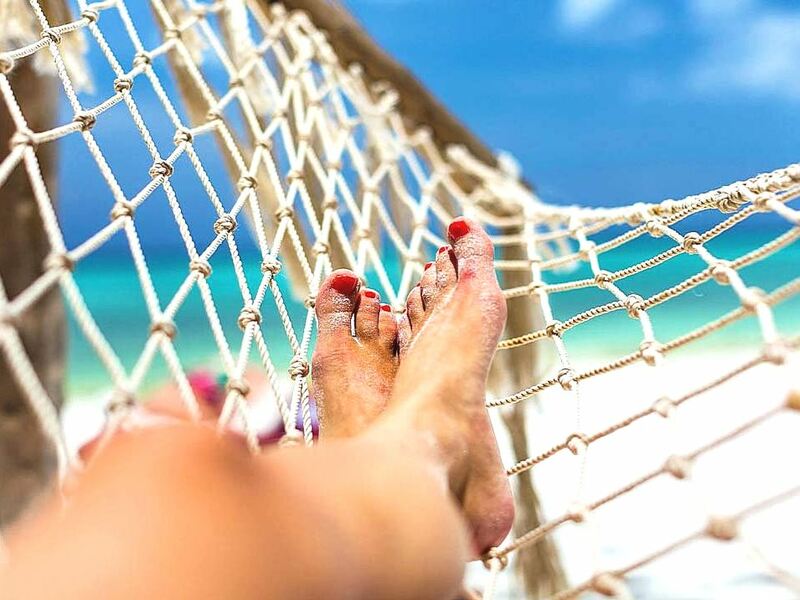 Take a good novel and flop into one of the many loungers and hammocks-for-two scattered on the sands and get yourself a decent helping of sun-worshipping. When the tropical heat gets too much for you, either retreat into the welcome shade offered by the palms or better still take a dip in the azure waters of the bay. If you've worked up a thirst then simply plunge the little red flag thoughfully provided to you into the sand and - hey presto! - a waiter promptly appears to take your order! (a simple yet ingenious system that we're amazed more lodges haven't copied) Come 4 o'clock in the afternoon, one of the staff will come around offering delicious fresh fruit, whether you're lazing around the pool or under the palm trees on the beach! When marketing people talk about rooms being “on the beach” they must have had Pongwe in mind! The 16 Beachfront Rooms lie curved around the little cove and it’s simply a case of walking off your porch directly onto some of the softest, whitest sand you’ll find anywhere on the planet! The rooms themselves are clustered together in little semi-detached bungalows of 2 or 3 rooms that are reached via a short stroll down winding sandy paths from the main lodge – don’t be concerned about being disturbed by your neighbours though, as the walls are so thick we never heard a peep from the room next door when we stayed there. 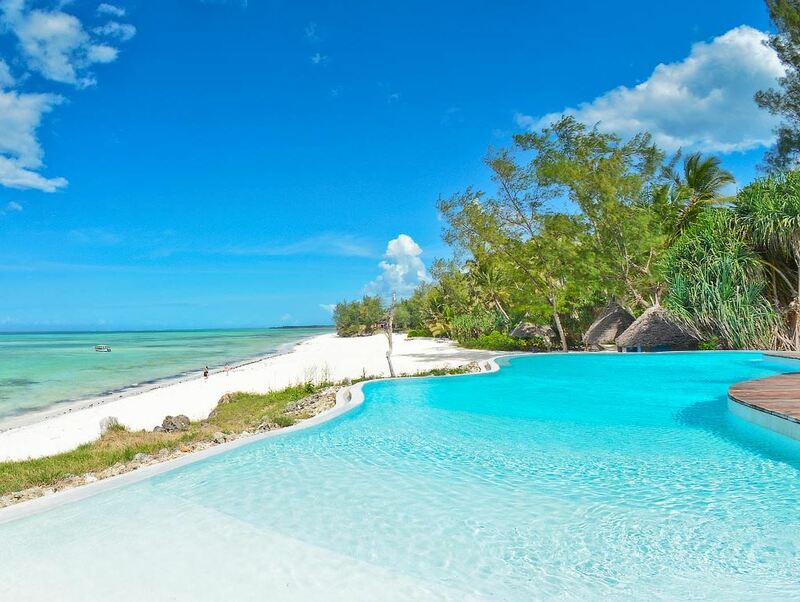 As you’d expect at this price the Beachfront Rooms are quite simply decorated - yet they’re relatively spacious and very clean with terrazzo floors, cooling ceiling fans and comfortable mosquito-net covered Zanzibari four poster beds decorated prettily with fresh flower blossoms. If you're looking for something a little more luxurious, then a bit more moola will get you one of the 4 stunning new Sea View Suites, each boasting their own private plunge pools! They're set back a bit further from the beach, but many find the extra space and privacy (and having your own pool of course!) well worth it. The star of the show at Pongwe though definitely aren't the rooms but rather the beach which is unquestionably the prettiest on the entire island! Like all the lodges of the East Coast, the beach here at Pongwe is affected significantly by the tide – the good news is that the lodge boasts a lovely swimming pool stunningly perched on a low cliff overlooking the beach which offers all day relief from the heat. A large makuti-thatched structure houses the sociable bar as well as a lounge area with comfortable baraza seating and the dining area. Talking of dining, the food at Pongwe boasts an enviable reputation, which is a good thing given that there are no other restaurants nearby! Service too is wonderfully friendly with the Pongwe team doing a great job in keeping their guests happy. One of the highlights that many of our clients rave about is the (extra cost) option of a romantic candlelit lobster dinner on the beach - an unforgettable experience! The result is all of this is that Pongwe is probably the most in-demand lodge on the entire island and a huge favourite amongst honeymooners in particular - in fact the biggest problem here is getting a room as the lodge is often booked out more than 6 months ahead! And little wonder too as Pongwe gets consistent rave reviews on travel review website tripadvisor.com. For romantics looking for a great value beach holiday on one of the most beautiful beaches in the world, there’s little or nothing to touch it! Children 4 years - 11 years sharing with adults: inquire about rates that apply Children 12 years and older qualify as "adult"
This lovely little lodge with its 8 comfortable bungalows sits perched overlooking THE finest beach on St Marie – it’s an idyllic spot for honeymooners or travellers looking for a few days of quiet and seclusion! 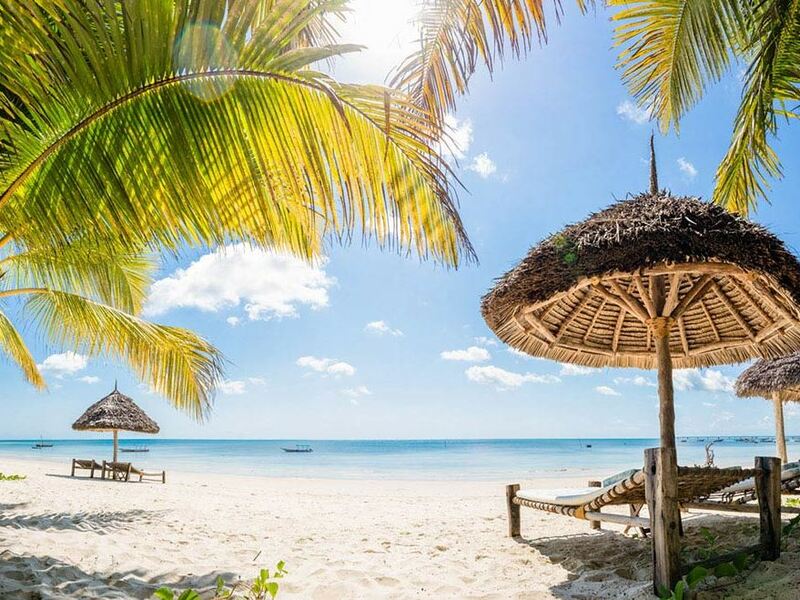 Position, position, position – with its remote hill-top position overlooking a magnificent white sand beach and the azure waters of the Pemba Channel, the Manta Resort is an absolute jewel!